This project started in March of 2015. I had recently finished my last series of paintings of women artists, called The Messengers and as always, in between series, there was a lull in my creativity while I waited for the next inspiration. I considered going back back to painting encaustic abstracts, but then I thought, “What do I most enjoy painting?” The answer was, faces. The idea for the 50 Faces project started out with a plan to make 100 faces. My daughter, Cynthia Hamilton, suggested that “Fifty Faces” had a nice ring to it. I agreed, still not sure how it was going to continue. I put out a request for people to send photos to my email address. I said I didn’t want smiling faces; no dark glasses and no babies. At first, I received some perfect photos. More photos came in, but many of them were blurry, too small, bad angles and just not usable. I decided that since I was not charging for the portraits, I could pick the best ones. I relaxed my rules a bit and did end up painting some faces with big smiles and one face with dark glasses. 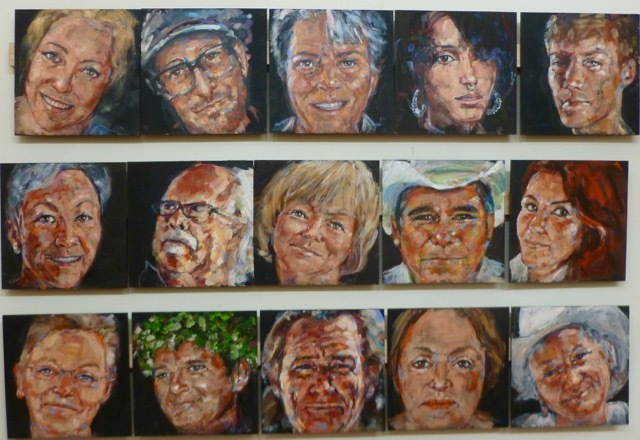 Each day for weeks, I looked forward to painting the faces of friends, family, acquaintances and strangers. I photographed the process of each portrait and published one each day on my blog, I did not start by drawing, but just began painting with bold, bright colors that became subtle suggestions of color on the finished faces.